Bring on the Sam the Eagle movie! This was a risky movie to try and pull-off. Not only are the superhero’s name, costume and weapon silly, but the blatant patriotism associated with the character is a tough thing to put on screen for the whole world to enjoy. I was not enticed to go see this movie at first. I was half expecting it to be a 2 hour lecture of Uncle Sam telling me to enlist and embrace the Ol’ Glory flag. 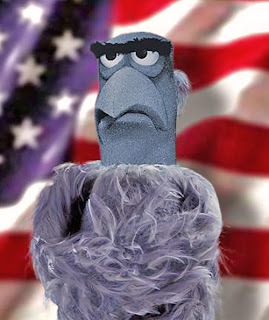 [On a side note, a full length movie that focussed on Sam the Eagle would be amazing]. Thankfully, they sidestepped most of the patriotism for bravery. They make a point of having Captain America’s ideology focus on bravery and courage rather than ‘the American way.’ One of the better parts of the film involves a self-mocking montage of the main character in a touring-spectacle show promoting America in hopes to raise war bonds. Since the film takes place in WWII, they approach the U.S.’s full-out patriotism as if it was a cute notion of the past that has since matured. I don’t want to get bogged down in the politics. The biggest selling point of this film are the characters. Everyone right down to the tertiary characters are well cast. The 2 competing scientists, Tony Stark’s dad, the love interest, the best friend, the loyal freedom fighters and Tommy Lee Jones are all memorable characters from the moment you meet them. Most importantly, the two main characters (Captain America and archenemies Red Skull) are interesting and absolutely fun to watch. This is finally a superhero who you care about, thanks to the opening act before he ‘becomes’ a hero. This pathos and like-ability is also what made Peter Parker/Spider-man so memorable from his movies. The majority of superhero movies either have a great hero or a great villain. Particularly for origin stories, the villain is often silly or useless (see Batman Begins (Scarecrow), Spider-man (Green Goblin), Iron Man (the bald guy), both Hulk movies). The villain in this film, Red Skull, is a truly interesting foil to the Captain. He is shocking to look at and just pure evil. Not to mention he is played by the ever-great and ever-evil Hugo Weaving. As the subtitle suggests, this is one of the many lead-up movies to the epic Avengers film that should come out next year. Therefore, there are some references to other superheroes in this film. Although the cross-referencing is not as annoying and prominent as it was in Iron Man 2, most of this plot hinders on things privy to the Thor movie. Even though I saw Thor a couple of months ago, it was barely memorable and so I was just confused with this plot (namely the motivations of the villain). Yet as mentioned earlier, because the characters are so well crafted, this subplot confusion is negligible. One thing that is unforgivable is the amount explosion jumping. It happens several times in the film, but most blatantly during an entire explosion-montage where Captain America jumps and escapes from fiery-death, just like any cheesy 90s action movie, but with more explosions and more slo-mo. Summary: Although there are no amazing stand out moments, this is a solid film from beginning to end; it offers nothing new, but does the old stuff so well. Thanks to the strong characters and casting choices, the cheesy hero works well and the Americanism is downplayed (as much as it can be) for other more important themes. If it wasn’t for the fresh WWII setting and a brave ending, this would be just another superhero movie. As my girlfriend said, “he’s not bad to look at either.” Captain America is solid entry into the comic book world as my #466 ranked movie [out of 1574]. Good review, I agree with your score and with a lot of points from the write up in general.